The Brownells Howa 1500 BRN-1 Chassis system is designed to provide an enhanced rifle setup for owners of a number of popular rifle actions. 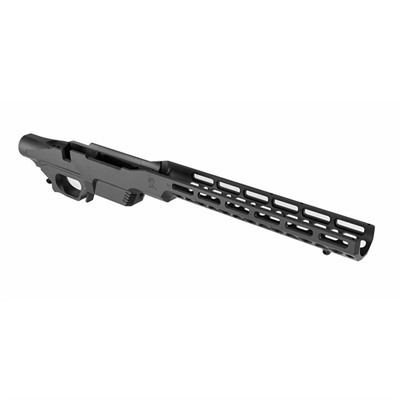 Manufacturerd by MDT, the chassis is developed exclusively for Brownells and is inspired by the design of MDT's LSS rifle chassis. A great option for precision long range shooters looking to upgrade their stock rifle. The BRN-1 Chassis system is set up to accept an AR-style buffer tube, allowing access to the incredible aftermarket of AR-15 buttstock accessories. The chassis also allows for the use of AR-style pistol grips, ensuring that owners can customize their rifles in any number of ways. The chassis is constructed from 6061 aluminum and features a V-shaped bedding system that accommodates most heavy barrels. The bedding system ensures that rifle barrels are free-floated for maximum accuracy. 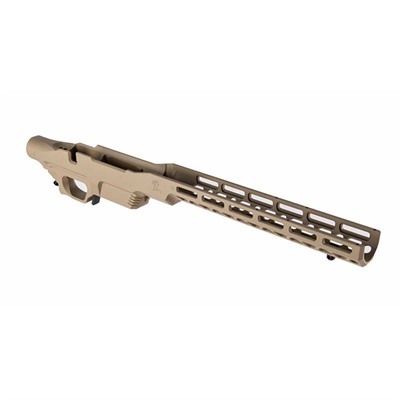 Only MDT polymer magazines will work in the short action chassis. The long action rifles will work with the metal 3.715" magazines without fitting. For .223 models the bolt stop may be too long. This can easily be modified.